The question that I am asked quite often by course creators is whether they should use WordPress or a hosted platform like Teachable for hosting and selling their online courses. 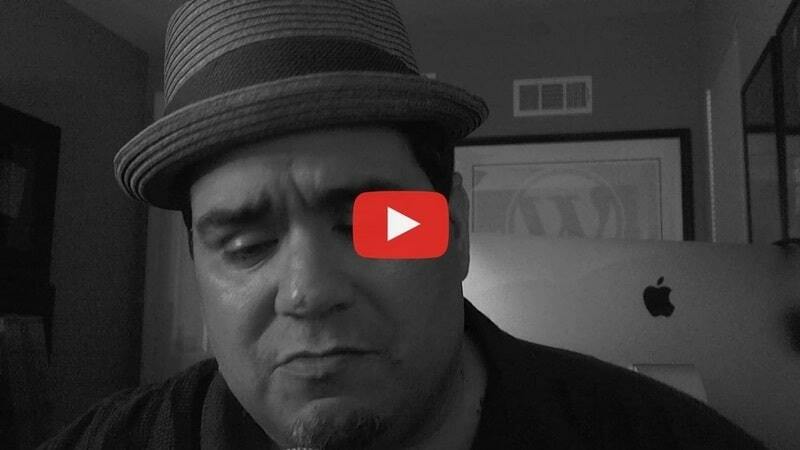 When I launched my first online course in 2015, there were not many options for building your online school and so, I went with WordPress which was the most common choice for creators then. While it took me around 1 month to create videos and other content for my course, I spent around 3 months learning about WordPress and various plugins & tools that was required to set up my course and start selling. 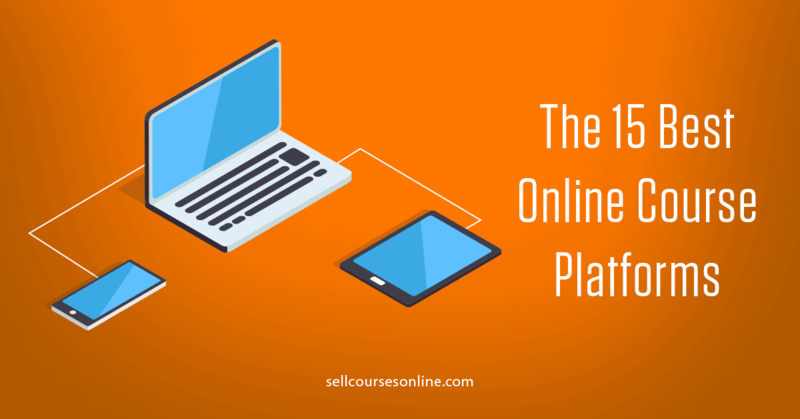 Since then the technology for hosting online courses has evolved quite a bit and modern course creators now have several different options to host & sell their online courses. Hosted course platforms like Teachable, Thinkific, Kajabi etc. Self-hosted solutions like WordPress, Joomla etc. While Teachable is a market leader in the hosted course platform space, WordPress is the most popular self-hosted solution for selling courses online. So where should you publish & sell your ﻿online ﻿courses? ﻿﻿Teachable ﻿﻿or WordPress? Easy to Use & Setup (No Coding Skills Required). No support for LMS features like elective/required courses, SCORM compliance etc. Less customizable compared to WordPress. Includes more powerful blogging capability. Who should use ﻿﻿﻿Teachable over ﻿﻿WordPress﻿﻿? Those who have little or no coding experience. Those who have no prior experience in selling any sort of digital products. Those who have been selling on WordPress but are facing technical issues too often. Those who don't have a course site yet and want to build one quickly. Who should use ﻿﻿﻿WordPress over Teachable? Those who require advanced LMS capabilities like SCORM compliance. Those who already have a course website on WordPress and it's working fine. Those who have required technical skills/support to build the site, take care of updates & maintenance and can work without 24x7 support. Or, you can stick with me and read this guide till the end and I am confident you will have an answer to which is the right platform for you. 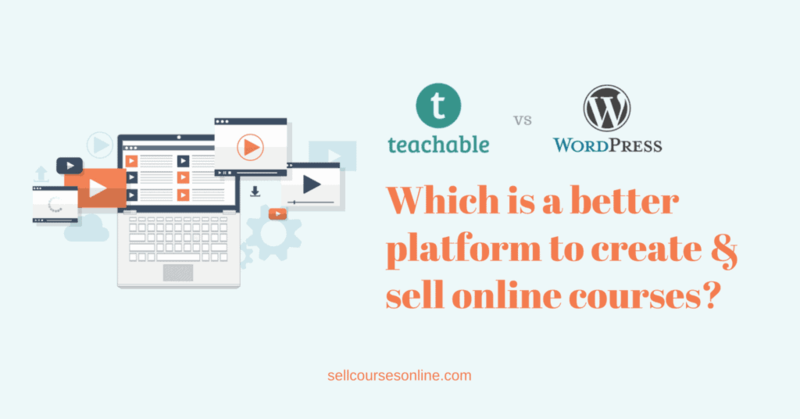 So, let’s deep dive into which is a better platform for selling online courses – Teachable or WordPress! Teachable ﻿﻿﻿﻿- What is it? 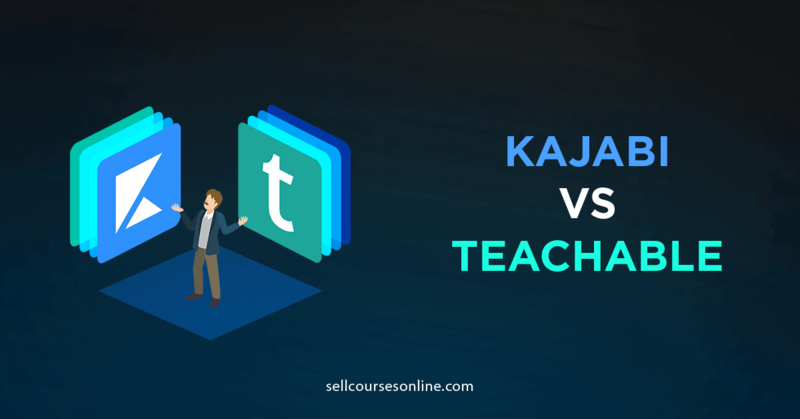 How does ﻿Teachable ﻿compare to ﻿WordPress ﻿when it comes to creating online courses? When should you use Teachable vs WordPress? 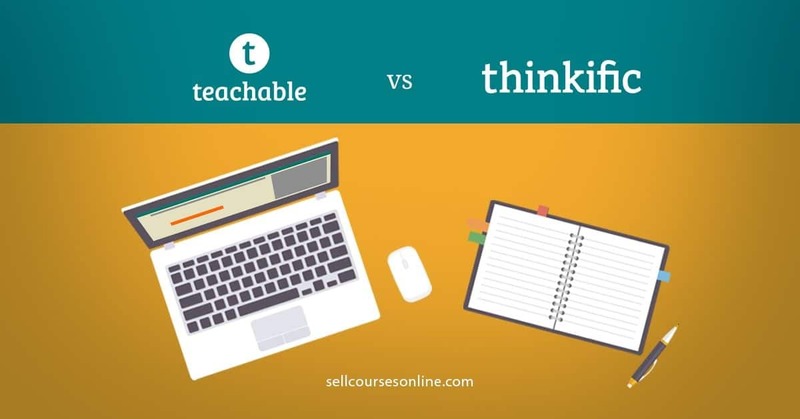 Teachable is an integrated solution for creating and selling online courses. When I say 'integrated', I mean you can build your course site, host & protect your content (videos, pdfs, quizzes etc. ), hide it behind a paywall, deliver the content to the students and further engage with them, and you can do all this even if you have no coding skills. More than 20,000 course creators including some big names like Pat Flynn use Teachable and it is certainly one of the best online course platforms. 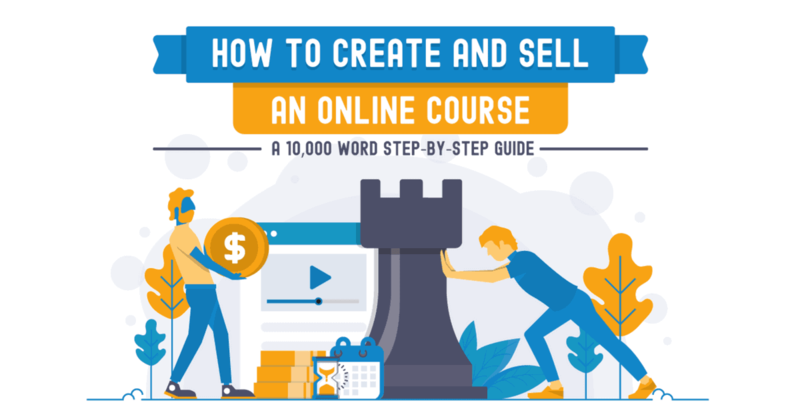 Build your course website and sales pages even if you have no coding skills. Deliver your course content professionally and further engage your students. Create engaging online courses - you can add video, audio, images, quizzes and other multimedia content. Create and send certificates of completion. In-built marketing tools like coupons, 1-click upsells and ability to create your own affiliate program. Accept payments through either Stripe or PayPal. Complete ownership of your course, content, student data, branding and pricing. These are just some of the features that Teachable has to offer. If you want to see everything that Teachable has to offer, you can download this free spreadsheet. The main difference between Teachable and WordPress is that Teachable is a hosted solution designed from scratch to sell online courses while WordPress is a self-hosted solution which can be used to create different types of websites including course sites. So, let's deep dive into how both these platforms compare with each other on dimensions like ease of use, customization, scalability etc. 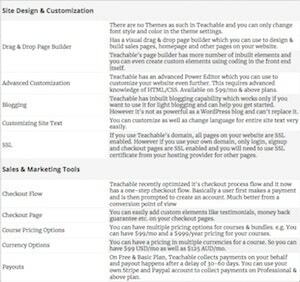 Teachable is much easier to use & setup compared to WordPress and to get started, you just need to sign up and create an account with Teachable. It provides you all the basic infrastructure that you require to sell courses online and you can create a full fledged course website quickly. Setting up a course website on WordPress requires you to put much more effort and time as you need to not just learn about WordPress but also about several plugins/solutions that you would need to choose from. However, you can create a good looking, full fledged course site on Teachable even if you don't have any coding skills or a technical background. Check out some of the schools created using Teachable here. When I switched to Teachable in 2015, I hardly had any coding skills and still I could get my course site up and running in a couple of days and it looked beautiful. Unless you want some deep customization on your website, you can do everything yourself using Teachable's drag and drop editor. However, you would need to have a minimum level of coding skills and decent technical knowledge to piece everything together in order to sell courses on WordPress. This is just about site building. Even uploading content and creating courses is a breeze on Teachable. ​You can bulk upload your videos, reorganize them into sections by dragging and dropping and without any customization, you will have a course which is ready to be delivered. Even though Teachable is much easier and quicker to set up, the end product in Teachable looks far more professional as far as course listing, sales pages, course player etc. are concerned. The course player design is excellent and helps further improve the user experience on the site. Professional look & feel of the site combined with better user experience is certainly an advantage that Teachable sites have over WordPress course sites. Teachable is an easier platform to customize and offers you enough flexibility. You can do basic customization on your site without touching a single line of code while for advanced customization, you can use their Power Editor (which requires coding skills). However, there is a limit to what can be customized and changed on Teachable. If you need some extra functionality, you will have to wait till they add this feature to their platform or you have to find a workaround to do that. But if you are using WordPress, you are very likely to find a plugin which will allow you to do these things which you weren't able to do on Teachable. Even if you don't find a plugin, WordPress offers you capability to build something from scratch for yourself, even though this might mean hiring external developers and incurring significant cost and time. However, from my experience of working with thousands of course creators, I can tell you that Teachable offers enough features & flexibility to meet the requirements of more than 90% of online course creators. 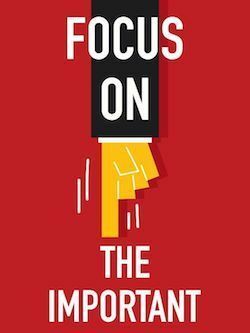 And you need to realize that there is an inverse relationship between ease of use and flexibility & customization and you must factor this in while making your decision. For those of you who have been using WordPress would know that the biggest pain point for selling courses (or doing anything) on WordPress is taking care of updates & maintenance on an ongoing basis. You always start with a few plugins but you slowly end up in a situation where you have two dozens or more plugins which are provided by different third party providers, so they conflict with each other, causing breaks, causing damage to your website. Also you need to constantly update the site as WordPress as well as other plugins are updated by their developers. Now every update has potential to cause a conflict and thus break your site. Even not updating things on your site is not an option as that can lead to serious security breaches and compatibility issues. Since a typical WordPress site has 20-25 different plugins, compatibility issues are very common and users end up spending 20-30% of their time on keeping their sites up & running. While with Teachable, their expert team takes care of the regular updates and maintenance for the entire platform and you can focus on more important things like creating & selling courses. 'Zero' updates & maintenance along with ease of use are two most important reasons why online course creators choose Teachable over WordPress. Scalability is an important factor in helping you determine the right solution for your business. You wouldn't want to use a solution which in any way hinders the growth of your course business. Firstly, you end up spending a lot of time managing your website and troubleshooting rather than on creating new courses and selling them. Secondly as your business starts growing, you need to consistently make sure that you have the right server resources and solutions to ensure smooth operations. e.g. As your site traffic increases, it is quite probable that your site speed & performance will be affected. You would require to add additional servers/RAM and take care of a lot of other technical aspects in order to suit your new scale. However with Teachable, website management and maintenance is minimum and thus you can focus on what you should - creating & selling courses. Moreover it doesn't really matter whether you have 100 or 10,000 students on your site or whether you have 10 or even 1000 courses. As a result, Teachable is used by businesses of all size - Individuals with a couple of 100 students as well as enterprises with more than 10,000 students (StackSkills, TNW etc.) 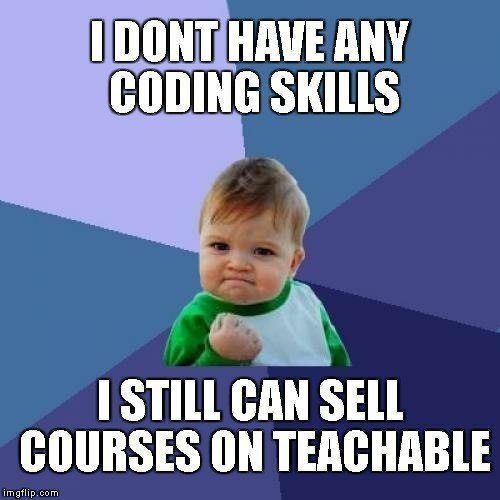 use Teachable to sell courses. The best part is that you don't need to worry about anything related to technology as your site grows in size and scale. And that's true in this case as well. WordPress blog is much more powerful compared to what Teachable offers. Teachable's blog is recommended only for light blogging and to those who are just getting started. If you are serious about blogging and if it is a critical part of your marketing strategy, WordPress is what you should be using for your blog. Does this mean you shouldn't have your course site on Teachable if you also want to have an active blog on your site? Absolutely not. In fact more number of instructors using Teachable use it to host & sell their courses while they use WordPress to create their blog. And it's very easy to create a seamless connection between the two. Teachable offers 24x7 expert support to its users. In case you encounter any issue on the platform, you simply contact the support team and they will solve it for you. While with WordPress, you don't get any support from WordPress team. You will have to depend on the support provided by the individual plugin developers or hire external support to take care of everything. As far as security is concerned, your site on Teachable is much more secure than your site on WordPress and their support is always there to help you in case something wrong happens to your site. In case your WordPress site is hacked, it is you who is responsible and you will have to do everything yourself to get it back. It is in these times that we appreciate the value of 24x7 customer support! I generally find most new instructors confused about creating an online course versus creating a Learning Management System (LMS) and they use the two interchangeably. So are you looking to create any sort of a Learning Management System? Are you going to have elective courses or required courses or prerequisite courses? Are you going to upload a SCORM package? Teachable doesn't support these advanced LMS functionalities. If you are creating an online course, Teachable will work for you as it does for 20k+ instructors. But if you are thinking of creating an LMS, Teachable is not for you. In this case, you should go with WordPress and use a solution like LearnDash. These are some of the critical differences between Teachable and WordPress for creating and selling online courses. Now, let's look at the cost fo building a course website. No comparison between the two platforms can be complete unless we take a look at the cost associated with using these platforms. You should expect to pay $500-$3500 as cost for setup and development to a developer (unless you do everything yourself) and then you can expect to pay a minimum of $700 per year (around $50 per month). This is the cost that you will incur if you are just getting started. The actual cost of creating & running a course site on WordPress depends on what solutions you choose and also on other factors like site traffic and number of students. The biggest disadvantage here is that you have make most of this investment upfront rather paying it on a monthly basis. With Teachable, you have a very simple pricing starting from $0 per month to $99 per month. There is a High Volume plan as well which costs $299 per month and is used generally by big clients. Teachable has a free plan as well which is good enough for you if you are just getting started. However, if you are serious about selling online courses, you should get on to Teachable's Basic Plan or above. The Basic Plan has a mixed pricing where you pay a monthly cost of $39 per month or $399 per year and also share 5% of your revenue. Even though sharing revenue might not sound like a great idea, the model works really well for those getting started. Rather than making a significant investment upfront, you can pay as you grow. And when you actually grow and make enough money, you can switch to the Professional Plan and you would no longer need to share the revenue. Another thing that I like about Teachable's pricing model is that the pricing is not based on number of courses, students or even video bandwidth. So, you get unlimited students, courses and video storage on every plan. Learn more about what's included in each of these plans here. As far as the actual cost that you are going to incur is concerned, it's very close for both WordPress and Teachable in the beginning. The only difference is that Teachable has a more flexible pricing plan and the level of commitment in terms of cost is lower for Teachable when you are getting started. Plus, WordPress can become really costly to manage and run as you grow beyond a certain point. As a result, Teachable suits the needs of both beginners as well as advanced users while WordPress pricing doesn't suit course creators who are just getting started. If you want to give Teachable a try, you can either create a lifetime free account or you can sign up for a 30-day free trial of one of their paid plans. You should now have a fair idea of what are the pros & cons of both Teachable & WordPress when it comes to selling courses online. Both Teachable and WordPress are used by all sorts of instructors for creating different types of courses. However Teachable stands out as an online course platform because of its ease of use, 'zero' updates & maintenance, customer support and pricing structure. You have little or no coding skills. You have no prior experience in selling any sort of digital products. You have been selling on WordPress but are facing technical issues too often and are frustrated with the technology. You don't have an online course site yet and you don't want to spend months before you can launch one. You want to focus on your core job of creating & selling courses so that you can scale your course business. If you wish to explore Teachable and see whether it works for you or not, you can click on the button below and check out Teachable! You want to create a Learning Management System and not just sell online courses (does elective/required courses, SCORM etc. sound familiar?). You want to customize every inch of your site and you are fine with either paying a developer to do that for you or you have the right coding skills to do it yourself. You already have a course site on WordPress and it's working fine for you. You are more than familiar with WordPress and you can cope without dedicated customer support. If you think that WordPress suits your requirements more, I recommend LifterLMS plugin for creating & selling courses as unlike most other LMS plugins on WordPress, it has integrated LMS, membership & e-commerce capabilites. Teachable and WordPress are both great platforms. However, Teachable is overall a better platform when it comes to selling online courses, simply because of its ease of use, 'zero' updates & maintenance and 24x7 support. WordPress scores over Teachable when it comes to advanced LMS capabilities like SCORM compliance or when it comes to flexibility & customization but you should use it only if you're tech-savvy. If you're not a tech-wizard and don't want to spend a lot of time setting up your course website and taking care of the techy stuff on an ongoing basis, Teachable is the ideal course solution for you. And you can always give Teachable a try and within hours you can tell whether this platform is for you or not. You can get started on Teachable for free. There can be specific scenarios which this guide doesn't cover. If you have any questions about these platforms based on your specific requirements, please let me know. Or if you feel that something important hasn't been covered in this guide, I'd love to hear about it as well.